Merkel cell carcinoma is a very rare disease in which malignant (cancer) cells form in the skin. 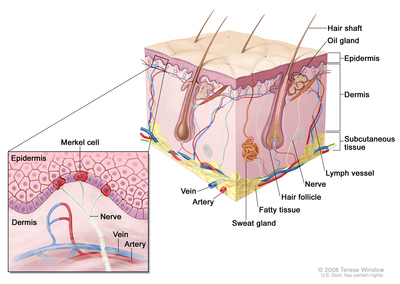 Merkel cells are found in the top layer of the skin. These cells are very close to the nerve endings that receive the sensation of touch. Merkel cell carcinoma, also called neuroendocrine carcinoma of the skin or trabecular cancer, is a very rare type of skin cancer that forms when Merkel cells grow out of control. Merkel cell carcinoma starts most often in areas of skin exposed to the sun, especially the head and neck, as well as the arms, legs, and trunk. Merkel cell carcinoma tends to grow quickly and to metastasize (spread) at an early stage. It usually spreads first to nearby lymph nodes and then may spread to lymph nodes or skin in distant parts of the body, lungs, brain, bones, or other organs. Merkel cell carcinoma is the second most common cause of skin cancer death after melanoma. Sun exposure and having a weak immune system can affect the risk of Merkel cell carcinoma. Merkel cell carcinoma usually appears as a single painless lump on sun-exposed skin. This and other changes in the skin may be caused by Merkel cell carcinoma or by other conditions. Check with your doctor if you see changes in your skin. Tests and procedures that examine the skin are used to detect (find) and diagnose Merkel cell carcinoma. Full-body skin exam: A doctor or nurse checks the skin for bumps or spots that look abnormal in color, size, shape, or texture. The size, shape, and texture of the lymph nodes will also be checked. Skin biopsy: The removal of skin cells or tissues so they can be viewed under a microscope by a pathologist to check for signs of cancer.